So moms and dads…baseball/lacrosse season is in full force and we all know what this means. Our mini vans are in full force and we are running like idiots from the office to school to the field for practice where you sit for hours…and hours…and hours. At least I feel like we do. And don’t get me started on the younger siblings who are totally bored and then of course starving and thirsty. Enter my magic tote bag with granola bars and 100 calorie pretzel packs. The kids always complain that the waters I toss in aren’t cold. I mean you cannot have your cake and eat it too. Or can you??? I just fell in love with this great product perfect for spring and summer called The Chiller. Here is a super simple and awesome way to enjoy your favorite beverage on the go. I always hate the insulated tote that you toss an ice pack or baggie of ice cubes in. Something always leaks. Honestly its a mantra over in this house. The chiller has freezing gel built into it’s walls. Yup; what I am telling you is that this is a tube with walls of icy goodness built-in that you just have to load up and head out. The chiller can hold (3) 12 oz drinks or (1) 750-1000 ml bottle. All I did to prep my busy afternoon was freeze it for 6 hours. You then load it up with your drink(s) of choice and chill them up in no time! You can even chill the “next round” while you enjoy your beverage. This will cost you around $49.00. Need a bigger option for the cabana, family picnic or bbq? 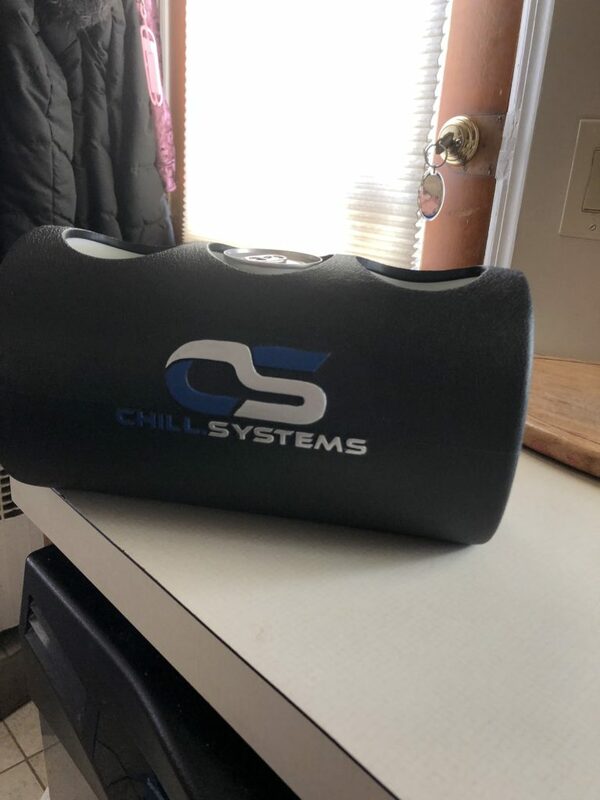 This awesome-sauce company also sells The Chillers Pack ($79.00) which holds 6 cans and 3 bottles as well as the chiller. Oh and it keeps them cold for 24 hours. This is some serious technology here! And no worries there is an even bigger model that holds 24 cans or 4 bottles of wine! I just love how well made these products are. Next Article PLAY + DISPLAY! — Win a Set of Removable Frames for Your Favorite Vinyl Records – A $121 value!